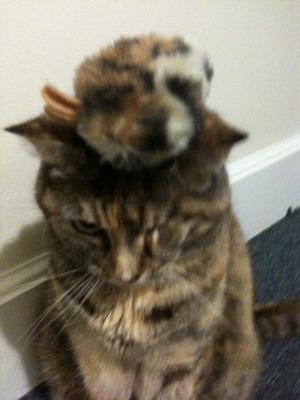 This is Annie with her favorite toy, Mimi, on her head. It's her birthday today, she is nine. Every night she would bring Mimi to the bedroom door and meow for a while, telling me she got me a gift. She rules the house and she makes sure I know it too. Sometimes she would "call" me from the bedroom. She didn't spend it with her boy toy, Jeremy, she's mad at him. It really isn't his fault, he had surgery 2 weeks ago, and she hasn't talked to him since!! Happy Birthday Ar Chu! Smooooch!! !